‘Blendoku 2’ Review – Does It Blend? I don’t envy puzzle game designers. In our hobby, there are plenty of genres where you can more or less get away with looking at what the big dog is doing, slapping a slightly different look on it, and maybe tossing in a new hat or two if you’re feeling particularly ambitious. You probably won’t do extraordinarily well doing things that way, but it’s certainly viable in some genres. Puzzle games are not one of those genres. Perhaps owing to the generally minimalist presentation most puzzle games use, people can spot gameplay imitations pretty quickly. Whether they’ll care or not is another thing altogether, mind you. That’s why I’m somewhat sympathetic to puzzle game developers who go back to the well a few times on an original concept. It’s hard enough to come up with something new and fun, let alone trying to successfully reinvent the wheel thereafter. Just ask Alexey Pajitnov. The way we play and buy games these days can make that a little weird, though. Take Blendoku (Free), as an example. It’s a creative puzzle game that has you placing different-colored blocks in a sequence to try to create a smooth transition of colors. The base game, which is free, includes hundreds of puzzles to solve. If you want more after that, you can buy one or more of the several additional level packs it offers as IAP. With this kind of set-up, it’s hard to know how, when, and if you should release a new game or simply keep adding to the existing one. To that end, Blendoku 2 (Free) brings a few new things to the table, but this is more than anything else a big, free level pack to the first game. If you’ve already played the original and are thirsty for more, you’ll be quite happy with what you get here, and if it wasn’t to your liking, you can safely walk on. 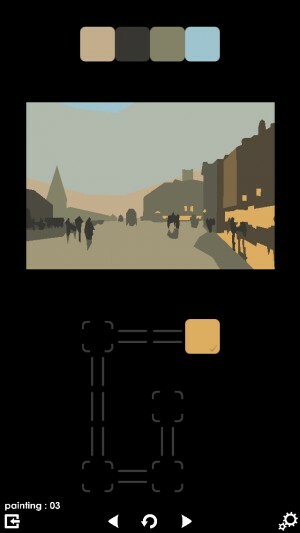 For those who haven’t played Blendoku, it’s essentially a game about color theory. You’re given an arrangement of cells, perhaps with one or two colors already placed, and an assortment of colored pieces. You’ll need to place each piece in the arrangement such that the colors of adjacent pieces transition smoothly into one another. 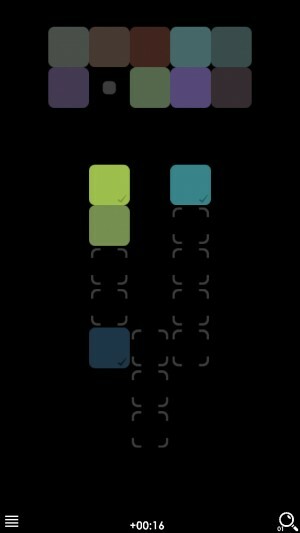 Like the first game, Blendoku 2 starts off quite simply, making you chain together two colors in straight lines for example, but it soon starts throwing in unusual patterns and multiple colors. You’ll have to consider how three or four colors blend, how colors blend vertically and horizontally, and so on. The number of pieces already set in the arrangement decrease slowly over time until you’re left putting the whole thing together yourself. Since it allows you to make as many moves and take as much time as you’d like without penalty, Blendoku isn’t as stressful as it might have been. There are incentives for exceptional performance in the form of medals for beating the average time and not making any mistakes, but nothing is stopping you from brute-forcing your way through by swapping tiles around until the answer clicks. Of course, as the cell arrangements grow in size and complexity, that method quickly becomes useless for all but the most persistent, but it’s there if you’re desperate. It might be smarter to take advantage of the game’s hint system in such cases, however. If you need help, you can generate a hint that will tell you where exactly one piece should go. After that, you can’t get another hint until a certain amount of time has elapsed unless you watch an ad or buy more hints via IAP. That’s actually a pretty fair system, if you ask me. The main gameplay addition in the sequel is the asynchronous multiplayer mode. Through an in-game profile or a Facebook login, you’ll face off against either a friend or a random player to see who has the best eye for color. 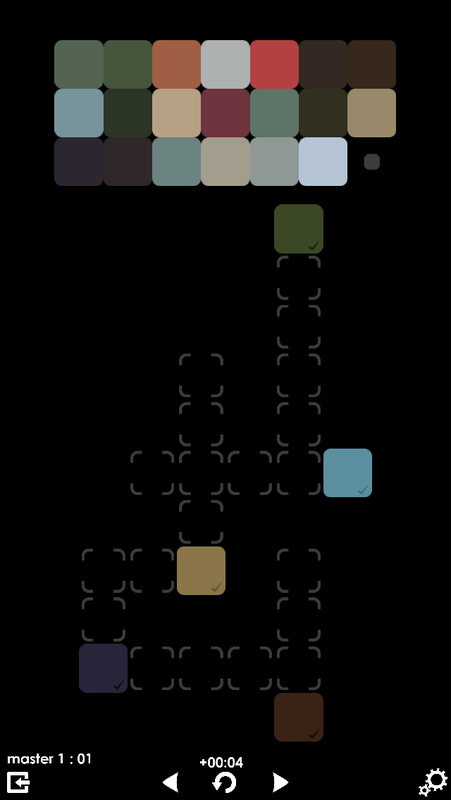 You and the other player take turns setting down tiles, scoring points for correct matches. Whoever has the most points when the puzzle is solved wins. Until you make a purchase in the game’s shop, each turn in multiplayer consumes a heart from your stock of five. Hearts will replenish over time or from watching an advertisement, and buying literally any IAP will completely remove this system. If you find yourself enjoying the multiplayer a lot, it might be worth buying something just to speed things up, but even if you’re playing for free, it’s not unreasonable. After all, you have to wait for the other player to respond, so unless you’re getting into a tense duel, your hearts will probably restore themselves more quickly than your turns come. The other new elements in this sequel are a bit more subtle. The presentation is somewhat improved, with a cleaner style and some relaxing music. 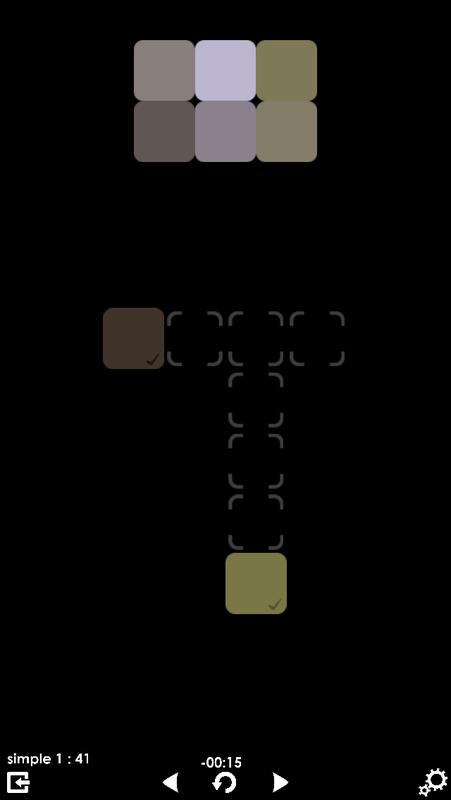 You can now zoom in and out if you’d like, helpful for bigger puzzles. The colorblind option added to the original game is here from the start, a nice feature that too many puzzle games forget to consider. There are a few new modes besides the standard and multiplayer modes, but all of them are marked at present as coming soon, save one. The Painting mode shows you a real historical painting with its colors unfinished. You have to place the colored pieces in the right positions to restore the painting to its proper form. You can’t jump right into this mode, however. Like the multiplayer mode, you have to unlock it by completing some of the standard puzzles to level up. Paintings will unlock one at a time, a fairly slow process when compared to the tens of seconds it will probably take you to clear each of them. Like the original game, Blendoku 2 is incredibly generous with its free content. There are more than five hundred free puzzles here, with additional level packs available as IAP if you can’t get enough. The stages are separated into four difficulties, with each difficulty offering a game’s worth of free puzzles and then some. I’m not sure how the developer intends to make money here, but whatever the plan might be, the game is heavily tilted towards the player’s benefit in its current form. I hate to say it, but there’s almost too much here. If you really get into what Blendoku is serving, I could see munching stages like popcorn until the end of time, but I imagine most people are going to get their fill well before the free levels run dry. The difficulty curve scales well, and the game does a good job of ramping things up at the right times to keep things interesting, but at least for me, it ran out of tricks long before it ran out of stages to serve up, making the back end of the game feel like something of a grind. There are far worse problems for a game to have than too much free content, though. If you haven’t played Blendoku before, I’d easily recommend skipping ahead to this one, as it’s a more refined and well-rounded package. It’s definitely worth a try if you’re looking for a new kind of puzzle game to play, as its clever color-matching gameplay is at once easy to pick up but surprisingly deep in the long run. Fans of the first game will be thrilled with the pile of puzzles this sequel offers, I’m sure, and for everyone else, this is probably all of the Blendoku you’ll ever need.